While 73% of online adults use several forms of social media, Facebook remains their first choice. 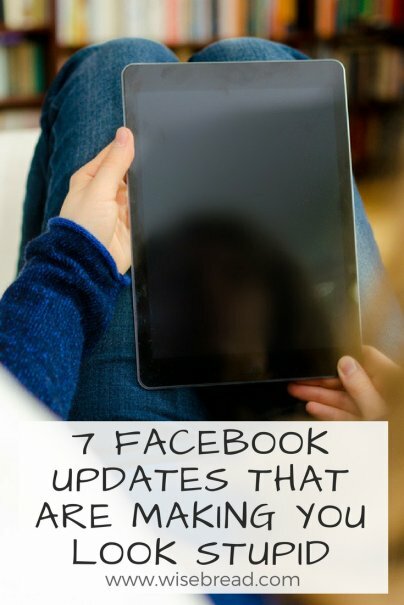 Here are the top seven types of Facebook updates to avoid. One of the best things about Facebook is the ability to interact with people around the world in real time. However, this ability should increase your awareness of what you're about to post. For example, when Facebook rolled out a feature that allowed its users to donate money to fight ebola, an user was quick to call out this as a marketing ploy from Facebook. The user even asked how much Facebook was donating to the cause. Facebook CEO Mark Zuckerberg personally replied to this comment pointing out that his wife and he had themselves donated $25 million to fight ebola. Before you post, make sure to check out your facts. After all, they're often just a Google search away. If you are too lazy to do it, you deserve to be called out. Most desktop and mobile browsers (e.g. Firefox) offer a spell checker, so use that feature to proofread your posts. The bulk of grammar errors result from homonyms, which are words that share the same pronunciation, regardless of their spelling. Some examples are your/you're, to/two/too/ and they/their/they're. Review this list of 200 homonyms and keep an eye out for them. Remember that you can edit the text of updates after they go live. Thank people that point out your grammar and spelling errors. A simple "thank you" is the only right answer; anything else only highlights your mistake even more. Using all caps in your Facebook updates makes them harder to read. When you write in all caps, your text is 40% less legible than text using the right mix of uppercase and lowercase. You should reserve the use of all caps for very few instances, such as abbreviations and acronyms. Otherwise, you will come off as the crazy person in the park that shouts out random comments to strangers. That's a terrible look! While the first sentence sounds friendly, the second one sounds scary and intimidating. How would you rather be perceived? Imagine this scenario. You just poured battery fluid all over your hand and are experiencing a terrible allergic reaction. You are desperately searching for antihistamine cream, but can't find any. Don't be the person that goes for option e.
I agree with American Idol's host, Ryan Seacrest, in that the passive aggressive Facebook updates make you look like a brat. "I'll never be able to forgive you for what you did. I hope you realize that what goes around, comes around… you'll see soon enough." While people understand that you may have an ongoing argument with somebody, they may not understand why you're involving all of your 500 Facebook friends in it. Stop chastising that somebody with random and vague Facebook posts (also known as "vaguebooking"). Instead address your issue with that somebody in private and, more importantly, move on. Your Facebook friends will thank you for keeping their feeds free of drama. "Today, I'm heading with Bobby to the new Thai restaurant, Spices." "Only one hour until Bobby and I head to Spices!" "Allright! Lunch time! Spices, here we come!" "Just got to Spices, OMG, everything is so good." "Bobby got the panang curry!" "Nom, nom, nom, this is SO GOOD!" …then you're annoying the crap out of your Facebook friends. A recent survey puts "people sharing too much information about themselves" at the top of the list of what Facebook users strongly dislike. There are plenty of studies that recommend that the posting frequency sweet spot is between 5 and 10 posts per week. Keep your feed smart by posting around once per day — and maybe twice. First, half of American employers are using Facebook in their hiring process. You don't want to be the reason why a potential employer didn't hire your best friend. Second, some people just like their privacy. If you want to share updates and pictures of others, make sure that those others are ok with it in the first place. This is a major issue for parents: 68% of parents don't allow others to post photos of their child on Facebook. Don't assume that people (and their children!) want to be on your Facebook wall. Check for their permission and respect their desire for privacy if they decline your request. Be smart and stay out of trouble. What is your pet peeve of Facebook updates? Please share in comments — or on our Facebook page! I think you should check your article for grammatical errors, especially if you are going to report on it. Sounds fair, Sherri. Could you please point out those grammatical errors?